On a higher education campus, safety is always a concern, and finding technologies that help keep people safe is always in demand. From Oct. 31–Nov. 4 in Philadelphia, higher ed IT professionals will gather for the EDUCAUSE Annual Conference. The conference offers a number of different learning tracks and more than 275 exhibitors showcasing the latest advances in higher ed IT. We’ve also released an eBook offering a 12-month plan for enhancing communication and safety on campus. Download the eBook, or visit our booth. Our team is ready to answer your questions! So be sure to explore our website and blog for the latest news, topics, and updates related to emergency mass notification systems. Singlewire will be posting updates throughout the event on its own channels, so be sure to follow us on Twitter, Facebook, and LinkedIn as well. 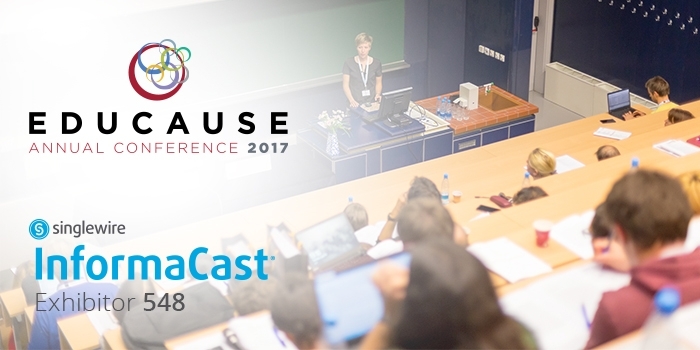 EDUCAUSE is a higher education technology association and the largest community of IT leaders and professionals committed to advancing higher education. It supports those who lead, manage, deploy, and use information technology to anticipate and adapt to change, advancing strategic IT decision making at every level within higher education.